In the economics of the country the transport sector plays an essential role. Essentially the energy crisis depends upon the increasing in population and living of human beings. Now a days due to increase in the demand for diesel and other petroleum products, India is dependence on oil import is expected to increase by 92% in the year of 2030. To decrease the energy crisis demand for an alternate liquid fuels, especially the biodiesel is increasing. There are some disadvantages of using biodiesel such as slightly decrease in fuel economy, slightly greater density, less cloud and pour points and higher NOx emissions. By using some of the modus operandi to reduce the above drawback which is tailored fuel, fuel additives, hybrid fuel and result that reduction in emissions and improvement in performance of the engines. By the addition of nano additives with biodiesel results give better fuel properties, to improve the combustion efficiency and also to reduce the harmful engine emissions. And also adding up of the additives the diesel fuel causes a reduction in particulate emissions, decrease in the oxidation temperature and an increase in the percentage of the NOx emissions. It is observed from the literature review an effort has been taken up to make use of neat biodiesel and to further make it efficient and viable. In the present investigation biodiesel produced from Mahua oil and also investigation on performance and emission characteristics were evaluated by using compression ignition engine. Puhan et al. Conducted experiment on four stroke diesel engines by using Mahua oil methyl ester. He observed that there is an increase in Brake thermal efficiency as well as Brake specific fuel consumption. Coming to emissions, there is an almost reduction of 63% in HC, 70% in smoke intensity, there is marginal reduction of NOx and CO but slight increase in CO2 than that of neat diesel. Bhatt et al. investigated on Mahua oil methyl ester one of the substitute fuel for diesel in the diesel engine more modifications done and observed that 20% Mahua biodiesel  can be used easily in diesel engines without any difference in terms of brake power, brake specific fuel consumption and power output. He also concluded that by varying the compression ratio from 16:1 to 20:1 then the engine performance  improved. Agarwal et al. Investigated on the performance and exhaust emission of Mahua oil blends in a four-stroke diesel engine and also compared values of it with diesel fuel. From this observed that all Mahua oil blend (10, 20 and 30%) has given almost similar thermal efficiency  and those values are very close diesel fuel values. They pointed that 30% Mahua oil blend is found to be more thermally efficient for their work. At lower loads, found that the Mahua oil blends give higher smoke density  compared to neat diesel. The smoke density depends upon the increased with the proportion of Mahua oil in diesel. Karthikeyan et al. found that by the use of light surface to volume ratio of nano-particles  the combustion characteristics were improved due to this the more amount fuel will be reacting with air. And also due this the brake thermal efficiency improved. By the use of zinc oxide (ZnO) blend the minimum CO and HC emissions observed. The aluminum nanoparticles can be reacted with water at a temperature in the range of 400 to 6500 C to form hydrogen. In the trans - esterification process the vegetable oils are reacted with alcohol in the presence of catalyst producing biodiesel. In this process Mahua oil reacts with methyl alcohol in the presence of a catalyst (KOH) to produce glycerol and fatty acid ester . The methyl alcohol (200 ml) and 7.5 grams of KOH were taken in a round bottom flask to form potassium methoxide. After that the potassium methoxide mixed with Mahua oil (1000 ml). The mixture was heated up to 60-650C and held at that temperature with constant stirring speed (500 RPM) for 2 hours forming ester. After that it was allowed to cool and settle in flask for 12 hours. Then two layers were formed in the separating flask . In observations top layer appeared as methyl ester and bottom layer as glycerol. After removing the glycerol, the methyl ester was washed with distilled water to remove the excess methanol. Due to the transesterification process improved the fuel properties like viscosity, specific gravity, and flash point. The properties of diesel, Mahua biodiesel and B30, B50 are listed in (Table 1). Table 1: Fuel properties of diesel and biodiesel blends. The investigational arrangement consists of single cylinder, four stroke, water cooled, direct injection, naturally aspirated, diesel engine coupled to water brake dynamometer for loading of the engine. The engine was operated at speed 1500 RPM with compression ratio 17.5:1. With the help of the burette and stop watch fuel consumption was measured. Thermocouple is used to measure the exhaust gas temperature. In this experiment the exhaust gas analyzer is used to measure the exhaust gases like CO, HC, and NOx. Experiments are conducted with pure diesel, diesel blend of Mahua oil for B30 and B50 . The effects are plotted against load (%). The experimental set up as shown in (Figure 1). Experimental Procedure: Initially the engine was started on neat diesel fuel and warmed up. The warm up period ended when the liquid cooling water temperature was stabilized. Then the fuel consumption and exhaust emissions of CO, HC, NOx and smoke were measured and recorded for different loads. Similar procedures were repeated for the Mahua oil methyl ester (MOME) fuel. The experiments were carried out by using neat diesel as the baseline fuel, i.e. it was denoted by B0, 30% biodiesel+70% diesel (B30), 40% biodiesel+60% diesel (B40), 50% biodiesel + 50% diesel (B50) at different engine loads from 0% to 100% rated engine load in approximate steps of 25%. Before operation the engine to a new fuel, it was acceptable to run for adequate time to consume the residual fuel from the preceding experiment or remove the oil from that engine. To measure the performance parameters, important operating parameters such as power output, fuel consumption, exhaust emissions and cylinder pressure wave measured. Engine performance parameters such as specific fuel consumption and brake thermal efficiency of biodiesel and its blends were measured . (Figure 2) shows that the variation in brake thermal efficiency in case of diesel, B50, B40, and B30. It is clearly seen that BTE increases with increase in load due to the complete combustion. From the present test results observed that B50 has shown highest brake thermal efficiency than that of other test fails because of its lower heat content, higher viscosity, higher density and lower volatility in comparison to diesel. The BTE obtained at full load for diesel, B50, B40, and B30 are 34%, 38.8%, 36.5% and 34.26% respectively. 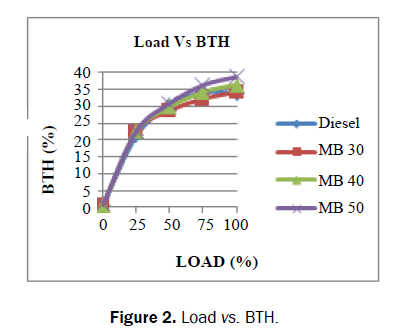 Figure 2: Load vs. BTH. Figure 3 shows that the variation in SFC for diesel, B50, B40 and B30. From the above graph observed that B50 shows that highest SFC compared to diesel and other test fuels. This is because high viscosity, density, low volatility and low heat content of biodiesel when compared with that of diesel. However, increasing the additive percentage in biodiesel, SFC decreases with respect to load and shows the results are closure to diesel values. This may due to improved combustion, low viscosity, and high volatility of the test fuels using additives. There are different values obtained at full load conditions for diesel, B50, B40 and B30 are 0.25, 027, 0.26 and 0.26 kg/kWh respectively. 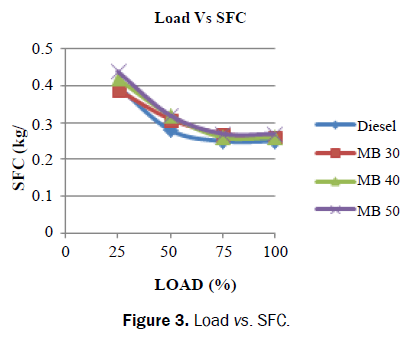 Figure 3: Load vs. SFC. 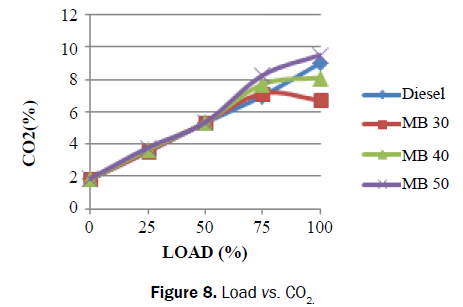 Figure 4 shows that the variation in CO emission with load. From the graph observed that the emissions of CO initially decrease at lower loads up to 75% and then increases sharply for all the prepared test fuels. At full load condition, B50 shows highest CO emissions because of poor spray characterization that results in improper combustion which gives rise to CO formation. To avoid this, we have to increase the additive percentage CO decreases for all the prepared blends. Because of good spray characterization, good air fuel ratio, and proper combustion. Maximum CO emissions for diesel, B50, B40, and B30 are 0.153, 0.161, 0.145 and 0.129% respectively. Figure 4: Load vs. smoke pacticity. Figure 5 shows that the variation in HC emission with respect to variation in load. Initially, B30 and B40 shows high HC emissions up to certain load compared to diesel after that at full load condition the B50 shows the highest HC emissions compared to other test fuels. Generally, biodiesel produces less HC emission in comparison to that of diesel because of better combustion of the test fuel and its blend with additive due to the presence of oxygen. However, with an increase in the % of additive HC emission increases with respect to load because of low cylinder pressure and temperature causing incomplete combustion i.e. low burning rate. HC emission for diesel, B50, B40, and B30 are 45, 49, 46 and 44 ppm respectively. 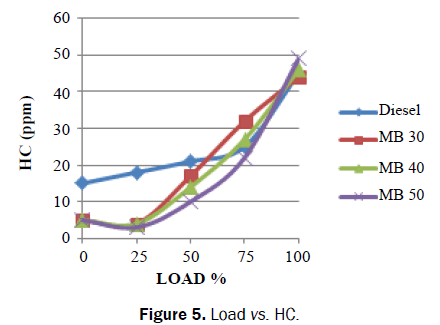 Figure 5: Load vs. HC. Variation in smoke emission with respect to load is shown in Figure 6. From the graph observed that diesel shows highest smoke emissions other than prepared test fuels. At full load smoke emission highest for B50 because of high viscosity, low volatility, high density, low heat content and heavy molecular structure in comparison to that of the B40 and B30 which may cause incomplete combustion because of lack of oxygen. However, with an increase in the percentage of additive, smoke emissions decreases and the results will be correlated with diesel. This may be due to reduced viscosity, increased volatility and a decrease in density of the biodiesel causing proper combustion. The smoke emission obtained at full load for diesel, B50, B40, and B30 are 76.6, 60.6, 55.8 and 51.1% respectively. 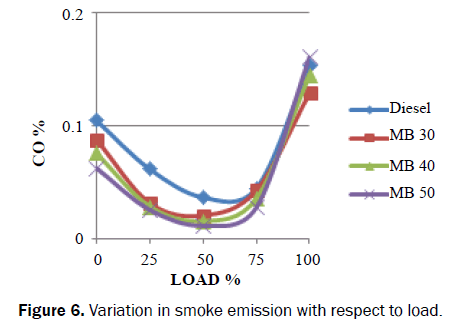 Figure 6: Variation in smoke emission with respect to load. 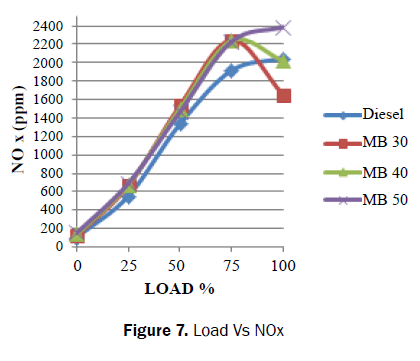 Figure 7 shows that the variation in NOx emission with load for diesel, B50, B40 and B30. From the literature review Nox is directly proportional to power output of the engine because NOx emission increases with increase in combustion and exhaust temperature. The above graph results show that NOx emission increases with increase load which is because of higher cylinder pressure and temperature at higher loads. It is found highest for B50 because of high oxygen content which results in complete combustion causing high combustion temperature. At the highest load NOx emission for diesel, B50, B40 and B30 are 2049, 2388, 2020 and 1653 ppm respectively. Figure 8 shows that the variation of CO2 emission with load for diesel, B50, B40 and B30. It can be observed that CO2 emission increases with increase in blends ratio of Mahua biodiesel. From the above figure B50 shows that higher CO2 emission rather than remaining test fuels. Increasing the load percentage then CO2 emissions are increasing rapidly for fuel blends. And also observed the values of B50 it shows higher than diesel vales. This trend may be due to complete oxidation of carbon present in the biodiesel due to its inherent oxygen content. By increasing the nano additives percentage then decrease the CO2 emissions. Figure 8: Load vs. CO2. In this paper several tests have been carried out practically on a four stroke, single cylinder water cooled DI engine using diesel, Mahua biodiesel blends of B50, B40 and B30 at different volume proportions. From the experiment results, following conclusions was given. Brake thermal efficiency increases with increase load in Mahua biodiesel and it is higher (B50) than pure diesel. Brake specific fuel consumption is higher for B50 at all loads because of high density, high volatility and low heat content of biodiesel. CO emission initially decreases up to load 75% and then increased at full load for all the tested fuels. At full load condition B50 shows the highest CO emissions because less oxygen content. Except at full load, for all other load conditions, HC emissions are less compared to other test fuels, because of complete combustion due the oxygen content. Diesel shows highest smoke emissions other than prepared test fuels. At full load condition, smoke emission highest for B50 because of high viscosity, low volatility, high density, low heat content and heavy molecular structure in comparison to that of the B40 and B30 which may cause incomplete combustion because of lack of oxygen. NOx emission increases with the increased load because of higher cylinder pressure and temperature at higher loads. It is found highest for B50 because of high oxygen content which results in complete combustion causing high combustion temperature. B50 shows that higher CO2 emission rather than remaining test fuels. This trend may be due to complete oxidation of carbon present in the biodiesel due to its inherent oxygen content. This work supported by V. R. Siddartha Engineering College, the Department of Mechanical Engineering, Kanuru, VJA. Sankarnarayanan G, Puhan s, Veda R N, Bopanna V, Bharat R. Performance and emission study of Mahua oil (Madhuca indica oil) ethyl ester in a four stroke naturally aspirated direct injection diesel engine. Renew Energy.2004:1-10. Bhatt YC, Murthy NS, Datta RK. Used Mahua oil as a diesel fuel extender. J Inst Engrs. 2004;85:10-14. Puhan S, Experimental investigation on a DI diesel engine fuelled with madhuca indica ester and diesel blend, Biomass Bioenerg, 2013;38:838-843. Godiganur S, Suryanarayan CH, Reddy RP. 6BTA 5.9 G2-1 Cummins engine performance and emission tests using methyl ester Mahua (Madhuca indica) oil/diesel blends. Ren Energ, 2009;34: 2172-2172. Agarwal D, Kumar L, Agarwal K. Performance evaluation of a vegetable oil fueled compression ignition engine. Ren energy. 2008;33:1147-1156. Sharanappa G, Suryanarayan Murthy CH, Reddy RP, “Engine performance and emission tests using methyl ester (Madhuca indica) oil/diesel blends. Renewable Energy. 2009;34:2172-2177. Raheman H. Combustion and performance of a diesel engine with preheated Jarophacurcas oil using waste heat from exhaust gas. 2014;115:527-533. Karthikeyan S, Elango A, Prathima A. Performance and emission study on zinc oxide particles addition with promolion stearin wax biodiesel of engine.J Sci Ind Res. 2014;73:187-190. MozhiSelvan VA, Anand RB, Udayakumar M. Effect of cerium oxide nanoparticles and carbon nanotubes as fuel borne additives in die sterol blends on the performance, combustion and emission characteristics of a variable compression ratio engine.Fuel col. 2014;130:160-167. Prabhu L, Satish KS,Anderson A, Rajan K.Investigation on the performance and emission analysis of TiO2 nanoparticles as an additive for biodiesel blends, J chem Pharm Sci. 2015;7:408-412. Lenin MA, Swaminathan MR, Kumaresan G, Performance and emission characteristics of a DI diesel engine with a Nano fuel additive. Fuel.2013;109:362-365. Sajith, Shobhan CB, Peterson GP. Experimental investigations on the effect of cerium oxide nanoparticles fuel additives on biodiesel.Adv mech eng. 2010;36:1-16. Santhanamuthu M,Chittibabu S, Tamizharasan T, Mania TP. Evaluation of CI engine performance fueled by Diesel-plunge oil blends doped with iron oxide nanoparticles. Int JChem. Tech Res. 2014;6:1299-1308.